There are certain websites that I visit multiple times per day. Google Chrome offers the option under settings to open a specific set of pages each time I launch the browser. However, I am not a fan of having too many tabs open at once. An alternative would be to install a Chrome App that links to those sites for easy access. However, not all websites have Chrome Apps available. For example, Schoology does not offer a Henrico version of the Chrome App. Well, fear not, Chrome users can create an unofficial locally stored app right from the Chrome Browser. 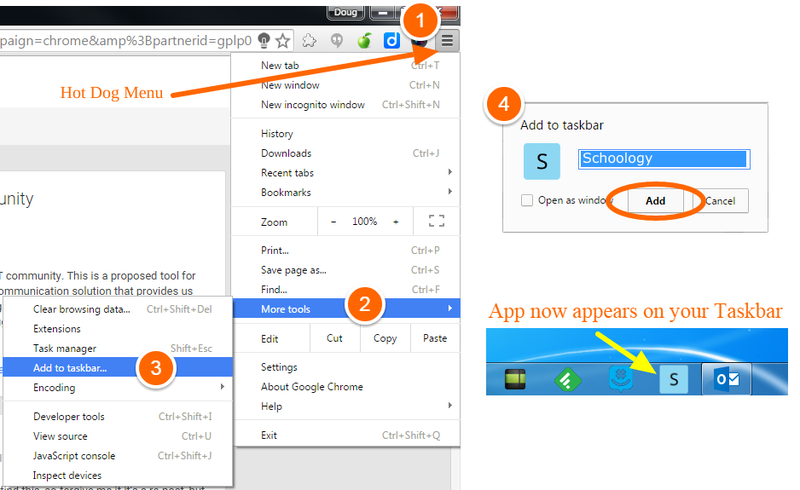 Once created the app can be docked on the Windows (or Chromebook) task bar; Simply follow the steps below. Launch Chrome. Once you arrive at the site, click on the Hot Dog Menu (the 3 lines) and follow the 4 steps listed below.